Milk kefir grains are live active cultures consisting of yeast and bacteria existing in a symbiotic relationship. Adding the kefir grains to fresh milk yields a probiotic drink within 24 to 48 hours. This dairy kefir culture is reusable, and with care will allow you to make kefir over and over again. Milk kefir grains are a starter culture that can be used with soy or coconut milk if care is taken to occasionally revitalize them in dairy milk. (Complete instructions will be included with each order.) Coconut kefir in particular is quite thick, rich, and delicious. 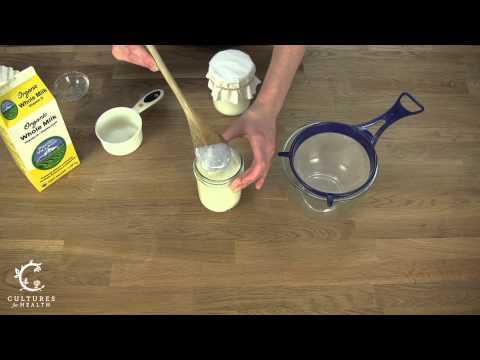 Click here for information on making coconut kefir. There are numerous uses for kefir including making a type of cream cheese, adding to smoothies, and drinking alone. Kefir can also be flavored after it has cultured and the kefir grains have been removed. Click here for more information on the numerous strains of bacteria and yeast generally known to comprise milk kefir grains. Ingredients: Organic whole milk, live active cultures. Packaged with a small amount of organic powdered milk to extend shelf life. Click here to see what bacteria and yeasts are in the Milk Kefir Grains. Milk Kefir Grains are produced in a facility that also processes soy, wheat, nut, and fish products. Shipping Information: Our Milk Kefir Grains are shipped in a dehydrated state in a barrier-sealed packet. Upon receipt, the dairy grains can be rehydrated in fresh milk (this process usually takes 5-7 days) and then used to make kefir by adding the grains to fresh milk, stirring, covering, and leaving at room temperature until the desired consistency is reached (no more than 48 hours). Complete instructions are included with each order. Click here to view our kefir instructions.